No need for a buzz box to set your timing on a magneto points system for a Bultaco. You can use a test light and external battery. Disconnect ground and the lead from the coil. Attach ground to battery ground and then attach the test light to the positive. Touch the backside of your points with the test light. When points are closed light lights up and when they are open it is off. Yes and who in the heck came up with MM BTDC instead of a degree wheel? Then try and set something to 3.3 mm with that vernier gauge? Lol! 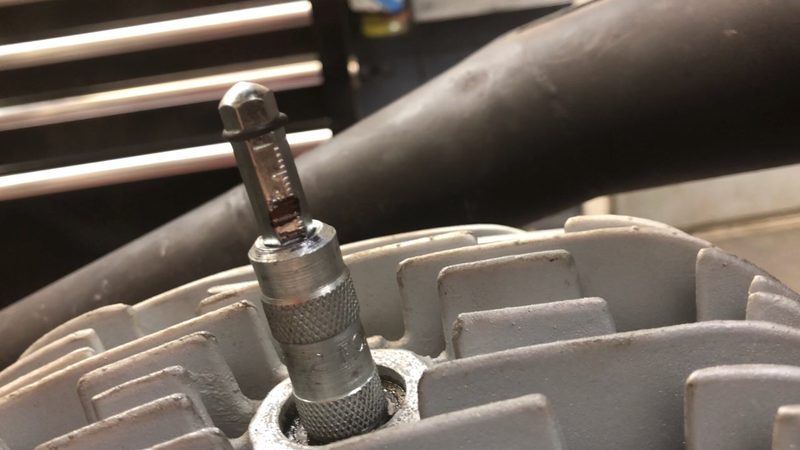 Some motors are very tolerant of ignition timing. As a huge generalization, 2 strokes can stand way more advance at lower revs and smaller throttle openings and need a whole lot less at the top end under load. It comes down to cylinder pressure. At low revs and small throttle openings there isn't a lot of air entering the cylinder to compress, so pressure is low and so is engine temperature. When it's on the pipe, pressure waves are effectively increasing the compression. Likewise at high revs, the throttle is wide open so it's pulling in more air. The one situation that is often an issue though is low speed high load, where the amount of air going through the motor is low and it's not on the pipe, but load is high and that raises engine temperature to the point that it detonates. If a motor is set up with a pipe that resonates at mid revs for good punch out of a corner but has ports that send waves out that work best at high revs, that will potentially make for a more complex timing curve. But if the overall state of tune is relatively low it may have a wide range of timing that work almost as well. For a drag race motor you want high effective compression ratio. Some of us do that with clever port and pipe designs to stuff more gas in and some of us just raise compression. The former approach will always make more power but isn't always an option. Motors that don't rev very high such as our old GTs with mild ports, crappy cylinder head design, and no existent pipe design are remarkably tolerant of timing. High revving high HP motors are way more complex. I'd suggest that you try a few different timings on the dyno to see what makes best HP and torque and use the least amount of advance that still gives good throttle response. Why do you think they put more advance into the Montadero and Bandido engines than the rest of the Bultaco line up? Gear drives vs chains crank to clutch? I'd speculate that it was how they were used, who they were used by. The 360 Montadero was a dual purpose bike that was a development of the Bandido and most likely would be ridden less hard than the race or MX bikes and the extra advance would perk up the mid range and throttle response. It made peak torque at a lowly 5000 rpm, so it was never designed to rev very hard. The Bandido is a full on MX bike - again a 360 and had a reputation for melting. Much of the blame was placed on the Femsa ignition and poor metallurgy but I have seen no tests of the ignition on a jig or dyno to support those theories. Neither model lasted very long and it is possible that Bultaco thought that the pointless CDI Femsa was more able to support more advance reliably or they just went too far in pushing peak torque and had too much advance for the motor. It's also possible that they changed the squish design on those motors. Some Bultacos has an offset squish band. The Montadero had a bath tub shaped combustion chamber with two wide squish bands at the sides of the head. Who knows what the squish band thickness was on any of those motors. That's all based on 5 minutes of Bultaco research and a whole lot of speculation, so take it for what it's worth. If you have ported that motor and or matched the pipe design, you will probably need less advance than stock even with a higher octane fuel. You have all sorts of scope for a better combustion chamber shape to get the squish band where you ant it in terms of width shape and thickness. Decide on an MSV value you like and design the head to generate that answer. Look at port time are and flow direction as they all impact on trapped volume/effective compression and match the pipe to the ports. Gear drive would probably be an improvement on chain driven clutches too. In the end, you have what you have, so it's time to optimize that package and start designing a new optimized package for next year. Zeke and I are starting on making a new swing arm tonight. I have his Mark 2 engine out of his bike and on the bench. It has an extra plug and I have a compression release for it. Reed valve. Will disassemble and post pictures.